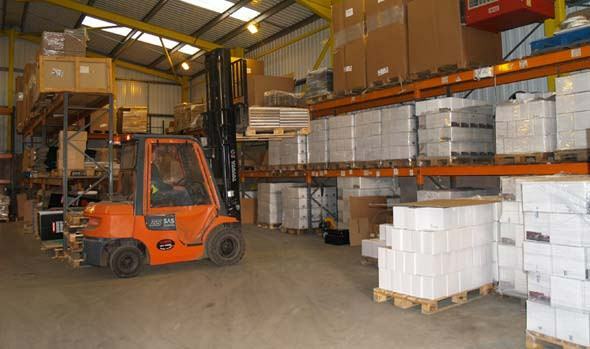 Our main warehouse has an inside capacity of 20,000 sq. ft. and an outside capacity of 50,000 sq. ft. safely secured 24 hours of the day. Temporary storage can be securely arranged for high value loads in transit or part loads waiting to be made up into complete shipments creating a one-stop-shop for our customers' logistical needs. A number of customers use our "bulk break" facility, where collections are made from the customer in bulk and brought back to our warehouse to be split into loads for delivery throughout the country. Onsite we have 3 and 4 tonne capacity forklift trucks and cranes so that palletised loads or containers can be easily handled. We specialise in handling awkward sized, irregular shaped or heavy loads such as high value machinery and we have never yet failed to meet any challenge.